Ideally located in the prime touristic area of Anuradhapura Town, Miridiya Lake Resort promises a relaxing and wonderful visit. The hotel has everything you need for a comfortable stay. To be found at the hotel are valet parking, tours, BBQ facilities, laundry service, car park. Guestrooms are designed to provide an optimal level of comfort with welcoming decor and some offering convenient amenities like shower, satellite/cable TV, in room safe, balcony/terrace, desk. Access to the hotel’s fishing, golf course (within 3 km), water sports (non-motorized), outdoor pool, garden will further enhance your satisfying stay. 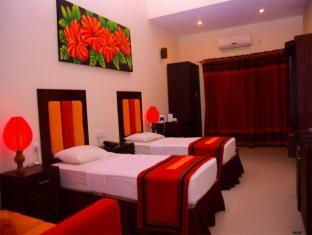 For reliable service and professional staff, Miridiya Lake Resort caters to your needs.